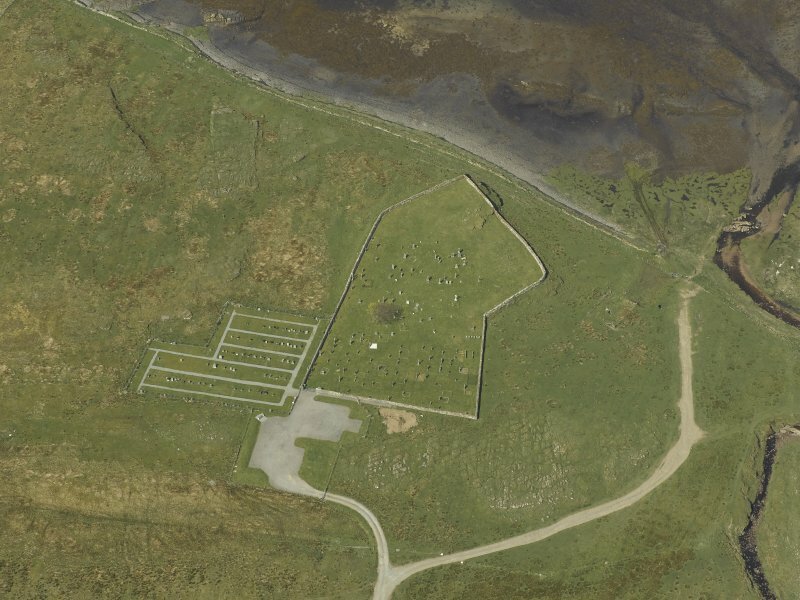 Oblique aerial view centred on the graveyard and the remains of the church, taken from the WSW. 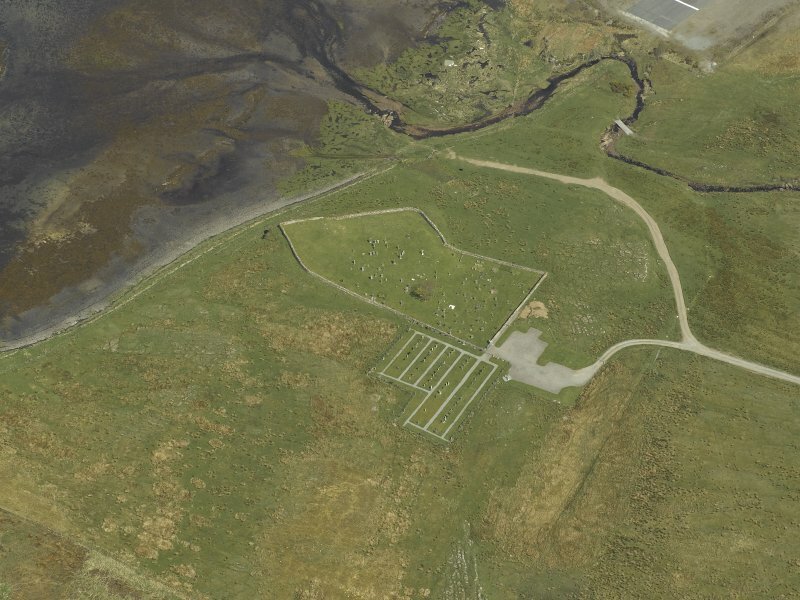 Oblique aerial view centred on the graveyard and the remains of the church, taken from the SSE. 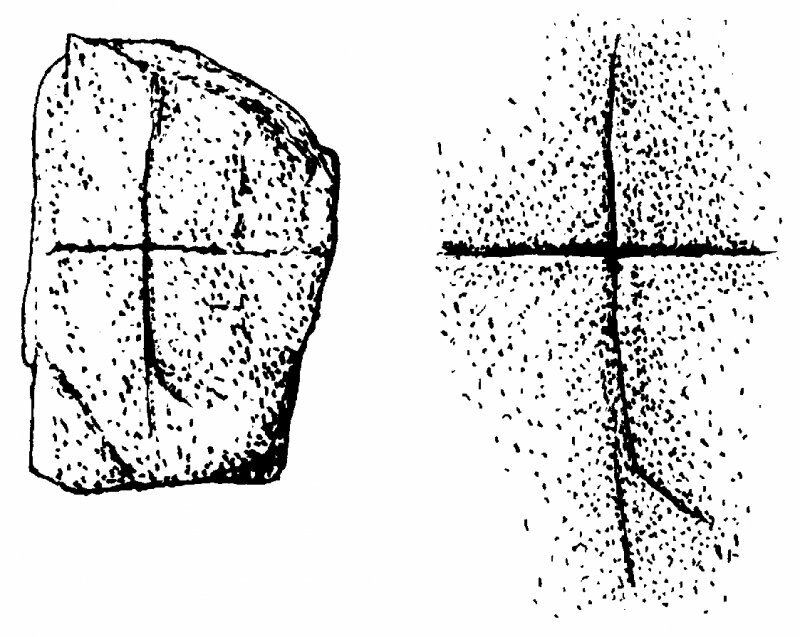 Digital copy of drawing of cross-incised stone, Cill Ashaig, Skye, with detail. 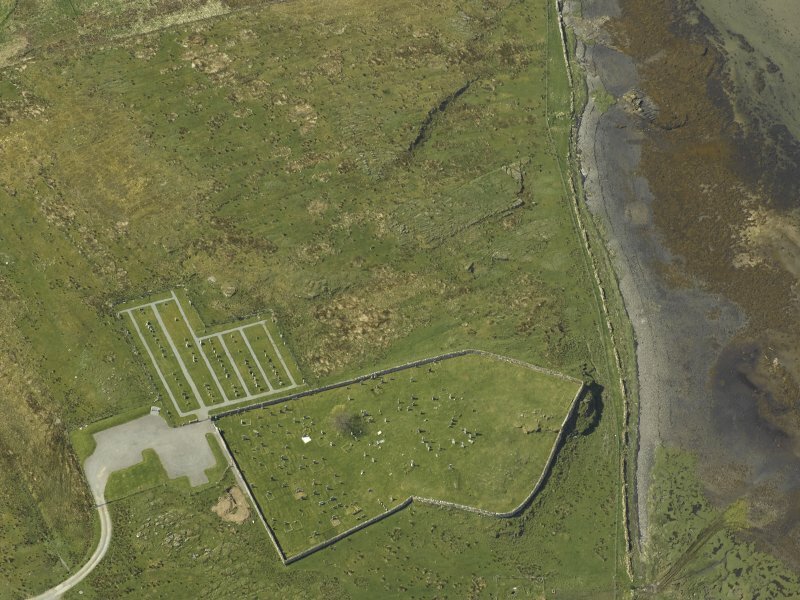 Oblique aerial view centred on the graveyard and the remains of the church, taken from the ENE. Present location: Highland Council Museum Service, Portree. Evidence for discovery: found in 1994 near the well, Tobar Ashaig, near the old burial ground. This roughly rectangular block is incised with a simple linear cross. Date range: seventh to ninth century. 675. Cill Ashik (Aiseag - Church of the Ferry), north-east of Lower Breakish, with graveyard. 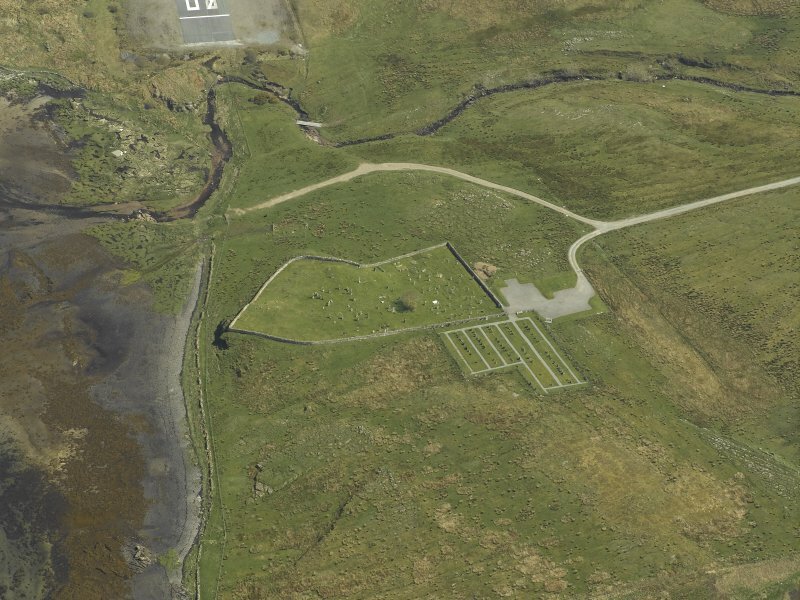 The site of Cill Ashik shows as a rectangular raised mound, containing much shell mortar and a few facing stones, occupying a natural rock outcrop in the highest part of the cemetery. It is orientated E-W an measures 9.0m along this axis and 7.0m transversely by 0.8m high. Tobar Ashik is a strong spring which issues from the hillside a few feet above sea-level; it is protected by a few stone slabs above and around its point of issue. Visited by OS (CFW) 17 April 1961. NG62SE 1 6867 2426 and 6872 2430. Kill Ashik or Askimilruby (Donaldson 1923), the church of the Ferry of St. Maelrubha. Tradition says that the ferry was used by the saint to cross from his monastery of Applecross on the mainland opposite. There is also a legend that beside the church grew a tree on which St. Maelrubha's bell was hung, the bell ringing of its own accord every Sunday, etc. Tobar Ashik, covered by a low building of large stones on the shore, is also attributed to the saint and the subject of legend. August 27th used to be kept at Bradford as La Maolruaidhe, St. Maelrubha's Day, the date of the Old Scottish obersvance of his festival (Donaldson 1923). In 1845 (NSA 1845) the church was presumably extant as it is described as 'remains of', but by 1876 (OS 6"map, Isle of Skye, Inverness-shire, 2nd ed., 1876) it had disappeared and Lamont (1913) says 'the foundations of the old church were discovered while a grave was being dug some years ago'. New Statistical Account (NSA) 1845; W Reeves 1857; D Lamont 1913; M E M Donaldson 1923; RCAHMS 1928.